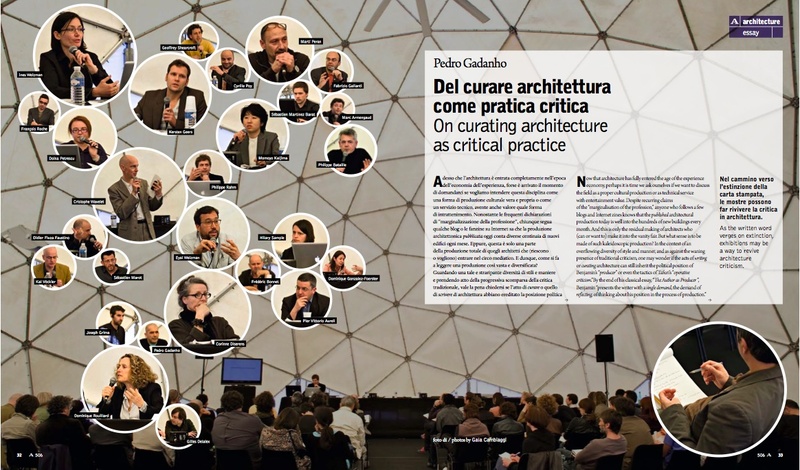 This essay first appeared in Abitare #506, September 2010. Now that architecture has fully entered the age of the experience economy, perhaps it is time we ask ourselves if we want to discuss the field as a proper cultural production or as technical service with entertainment value. Despite recurring claims of the “marginalisation of the profession,” anyone who follows a few blogs and internet zines knows that the published architectural production today is well into the hundreds of new buildings every month. And this is only the residual making of architects who (can or want to) make it into the vanity fair. But what sense is to be made of such kaleidoscopic production? Writing and curating architecture as cultural production implies considering conditions that the market – and the society of the spectacle – disregard as superfluous as Plato’s poets in a perfect society. It implies considering the need for architecture to create critical, social and political value; it suggests the need for architectural discourse to generate relevant narratives; and it implies the ability and the will to expand the field outside itself. In this sense, for instance, curating architecture is not to be a form of cure, nor a mere conservation of specific objects. It is rather to be a critical practice that identifies and questions the relationships of architectural production with society. It can be an experimental field that explores critical ideas on the value(s) of contemporary architecture. Hence, when I talk about curating architecture, I’m thinking about the mediations of a changing profession. For a short period – let’s say from the 19th Century up till very recently – architecture managed to be a fairly well-defined profession. Even if not as expanded as architects themselves wanted, the boundaries, the goals, and the operational fields of architecture, were fairly comfortable and consensual. During the heights of the modernist period, academia and specialized media contributed to establish a definition of a successful cultural practice that apparently needed no questioning. It may even be stated that the current international star-system is the end-result of this process. As all these definitions became increasingly self-satisfying for certain sectors of the profession, they also hinted at a gap between the architects’ self-representation as master-builders and, on the other side, the complexity, the roughness and the diversity of the situations into which architecture now has to insert itself. Up till now, the prevailing model of the architecture profession also fulfilled its role regarding the prevailing system of consumption. But the rules of consumption – cultural consumption included – are themselves constantly on the move and one cannot cling to a model of offer for too long. Maybe now architects have to offer other skills, other roles, other contributions. Maybe it is now unsatisfying to see architects as only architects. It’s within this context that I situate and question the contemporary roles of writing and curating architecture. Although master-builder (re)presentations may still be blockbusters at the ticket office or sure hits in print, one has to ask if these are today the best contribute to the advancement of architecture’s cultural profile. And although defining tendencies may still be important for the discipline’s self-understanding of its ongoing history, one has to ask if this is still the most critical gesture towards the repositioning of architecture before its now global audiences. Being one of the mediations that increasingly influence the cultural reception of architecture, the role of curating architecture needs therefore to be clarified in some of its values and ambitions. In an image-dominated world, critical discourse fails to inflate the minds. Thus, criticism follows practice obediently. Within this scenario, maybe critical tools should then be readdressed at the one medium that is located at the crossroads between the power of contemporary visual culture, the power of exhibition value, and the 30-line possibility of delivering a powerful and effective message to a larger audience. That is, maybe critical thinking should be readdressed at exhibition making. But this approach has, of course, its own catch 22’s. As Hal Foster reminds us in Design and Crime, it was Walter Benjamin who pointed out that the so-called exhibition value may be identified with the exchange value that pervades the field of art, transforming both its meanings and contexts. As applied to architecture, this might be translated into the notion that exchange/exhibition value has effectively become a powerful symbolic mediation that affects and distorts previous professional values. When considering the visibility of architects and buildings, ability to display is now everything and exhibition value is, effectively, the only thing the media are after. Of course, architecture exhibitions dwell themselves on this exhibition value and help constructing it. And as such, it is obviously difficult for their organizers to recur to exchange value without merely succumbing to it. Like Beatriz Colomina had already suggested by the end of the 80s, as architecture is reproduced through the mechanisms that rule the world of exhibition value, those who are involved in the activity of diffusion must critically address the way the cultural meaning of architecture is being altered by reproduction itself. In this context, the figure of the curator appears as being responsible to articulate exhibition value not only in itself – that is, producing the seduction and appeal of appropriate display – but also as a critical device which helps reorganizing and restructuring the meanings and general perception of architecture and its practice. Thus, curating architecture also directs us to an appropriation of exhibition value that, ultimately, favors the reappearance of architecture in the public sphere. As Arjun Appadurai would put it, choices and appropriations in the cultural arena are co-dependent on the way cultural productions display and represent themselves. If architecture wants to be a part of these choices, it too will have to use its own exhibition value to represent itself as something ready to be shared by a wider audience. Within this context, for me, curating architecture has been about understanding and criticizing architecture culture while, simultaneously, maximizing its own audience outside the field of architecture. In this sense, making an exhibition is a learning process, a critical research whose results are, as if by coincidence, immediately exposed before the eyes of the public. On the contrary, imagining an exhibition as only a promotion of a certain cultural practice, a certain author or a certain tendency becomes an insult of sorts to a culturally demanding public. Curating architecture, thus, essentially becomes a critical mediation, and, as such – and even when addressed to an unknowing audience – its activity must reveal the tensions that lie beneath the surface of architecture practice. That is, while architecture exhibitions may hit at the power of today’s visual culture, they should also play with the sort of multilayered discourse which was, at some point, proposed by Umberto Eco as the so-called open work. The visual may hide content under a glossy seduction, but it may as well carry deeper layers of meaning to the most attentive or knowledgeable members of an audience. The critical efficiency of curating architecture thus depends on its ability to use Benjamin’s notion of exhibition value on behalf of making criticism not only intellectually challenging, but also irresistibly seductive.